RAC Signature member, Suzi Zefting-Kuhn has been juried into the 83rd Annual Hudson Valley Art Association’s National Juried Exhibition to be held at the Salmagundi Club in NYC. Reception is Friday, April 1st 5-8pm. 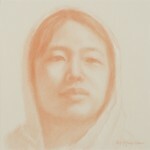 Her accepted piece is a pastel pencil portrait titled ‘Tigress’.